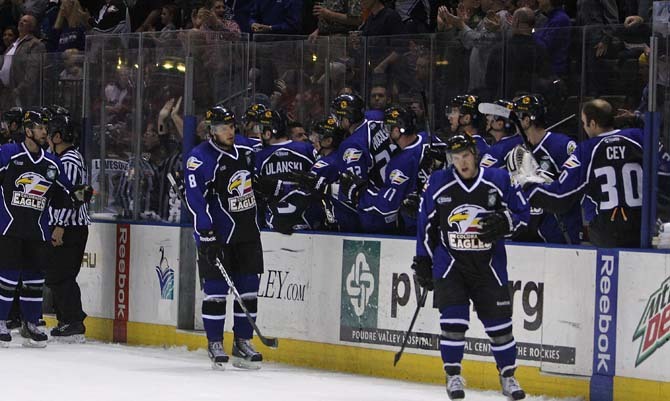 LOVELAND, Colo. – Chad Costello recorded a hat trick in the first period of the Colorado Eagles’ 5-4 win over the Stockton Thunder at the Budweiser Events Center, as the home team clinched its 9th playoff berth in as many seasons — their first in the ECHL — with the win. The Eagles scored two power-play goals on the night and Kyle Jones made 34 saves in collecting his 27th win of the season. Costello singlehandedly out-scored the Thunder in the first period to help the Eagles to a 4-2 lead at the first intermission. His first goal came 1:18 in on a power play when Kevin Ulanski sent a pass from below the right circle, through the crease to Costello along the goal line on the opposite side of the net. With his skates on the endboards side of the goal line, he was able to roof a sharp-angle shot. The Eagles went up 2-0 at 9:18 after a cycle in the left corner led to Liam Huculak finding defenseman Ben Chiarot crashing the left post. But Stockton cut that lead in half at 15:03 when Jody Pederson’s shot from the left point was deflected in the low slot by Jason Morgan. Costello restored that two-goal cushion just 16 seconds later when he picked up a loose puck in the high slot, skated in on Thomas Heemskerk and stuffed a forehand chance over the goal line. However, Max Campbell trimmed the Eagles’ lead again at 16:51 by chipping a centering pass past Kyle Jones from the slot. Costello, though, was undeterred, and with 33.8 seconds left in the first period he registered his 3rd hat trick of the season — and his career. On the play, Patrick Cey sprung him with a lead pass down the right wing and he blew a shot past Heemskerk from the right circle to elicit the raining hats. Stockton out-shot Colorado, 9-5, in the second session, getting the period’s only goal at 3:48 when Chris D’Alvise swung unimpeded through the right circle from behind the Eagles’ net and into the slot where he snapped a shot past Jones to make it 3-4. The Eagles stretched their lead to 5-3 with their second power-play tally of the night at 8:46 of the third period when Ulanski snapped a shot home from the right circle. But with Colorado on another power play a few minutes later, the puck jumped over Kyle Peto’s stick at the blue line, leading to a Jordan Fulton breakaway that resulted in a shorthanded goal that cut Colorado’s lead back down to one. But the Eagles were able to hold on the rest of the way, securing the win & the playoff berth in the first of back-to-back games against Stockton. Site contents copyright © 2019 Recorder Online	except as noted. All rights reserved. | 82 queries in 1.083 seconds.